After a long and successful career at General Motors, John Z. DeLorean set out on his own to create a new car company. The first of several vehicles the company planned to produce was a sports car. DeLorean struck a deal with the United Kingdom to establish his manufacturing operations in strife-ridden Belfast, Northern Ireland in exchange for up to £100M of funding and a site on which to build his factory. With a home base established, DeLorean hired Lotus Cars, Ltd. to develop his prototype into a production car and recruited a group of motor industry veterans from the USA and UK to build a full-scale mass-production car company from scratch. 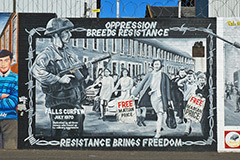 One of the hundreds of murals in Belfast, many commemorating paramilitary commanders or notable incidents during The Troubles. From 1978 to 1981, DeLorean Motor Company created a massive manufacturing infrastructure. A distribution network including 343 dealers was created to sell the cars in the United States, the prototype was developed into a mass-production car in only 22 months, a parts supply chain was established, a state-of-the-art 500,000 sq. ft. factory was built on a former cow pasture in Dunmurry, and 2500 workers (half Catholic, half Protestant) were hired to assemble the cars. Before the first sports car rolled off the line, the ambitious new company had even started developing a saloon car and a bus. The first DeLorean Sports Car rolled off the assembly line in January, 1981 and the first cars sold for far more than their $25,000 retail price (over $64,000 in today’s money). By late 1981, the production rate had been increased to 80 cars per day. Months later, however, cost overruns, a global recession, the poor exchange rate between the dollar and the pound, and the decision to stockpile cars without sufficient demand had all taken their toll on the company and it was out of money. The manufacturing subsidiary was put into receivership by the British government in February 1982. Eight months later, after failing to find additional investment, DeLorean Motor Company declared bankruptcy. Consolidated International (the company that became Big Lots) purchased the remaining parts inventory and vehicles, but allowed their option to continue production of the car to expire. The final DeLorean rolled off the assembly line in December 1982. Due to its unique design, history, and its role in the "Back to the Future" movies, the DeLorean has enjoyed continued popularity throughout the years. Thanks to its good build quality, a relatively plentiful supply of original parts, and a mostly-fanatical owner base, the majority of the 9170 DeLoreans built are still on the road today. 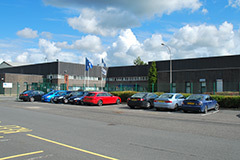 The former DeLorean factory in 2013. DeLorean Motor Cars, Ltd. in Belfast, Northern Ireland, produced 9170 examples of the DeLorean Sports Car between January 1981 and December 1982 (model years 1981-1983). The DeLorean features a Bosch K-Jetronic equipped 2.85L Volvo/Peugeot/Renault ("PRV") V6 engine mated to either a five-speed manual or three-speed automatic Renault gearbox. Italian designer Giorgetto Giugiaro styled the exterior, while engineering and development was performed by Lotus Cars, Ltd., borrowing heavily from the Esprit's design. Stainless steel panels, gullwing doors, sufficient room for a tall person, and a rear engine configuration were a few of the key design elements required by John DeLorean. Standard equipment included power windows, power locks, power mirrors, air conditioning, an AM/FM cassette stereo, a tilt and tele- scoping steering wheel, tinted windows, electric rear window defroster, and leather trim. The only options were between a manual or automatic gearbox and black or gray interior. No one knows for sure. The commonly-quoted number is 6500, but that's simply a guess. Typical dirt and grime are easily cleaned using standard automobile cleaner. For stubborn stains such as tar or bird droppings, mineral spirits, alcohol, or gasoline can be safely used on the stainless steel panels. Small scratches can be removed using Scotch-Brite pads. Deeper scratches require using specialty tooling to restore the grain. Is it reliable? Who works on DeLoreans? When restored and maintained properly, the DeLorean is extremely reliable and very pleasant to drive - a significant achievement for a completely new car developed in under two years. There are a few shops throughout the USA and Europe who specialize in DeLoreans. Aside from those, owners are typically on their own. Is it hard to find parts? Many can be purchased as new old stock via the Internet, while some are simply no longer available. The remains of the factory inventory now reside in a warehouse in Houston, TX. Due to increased popularity of the car, many previously-extinct parts are available as reproductions, created using the original engineering drawings.